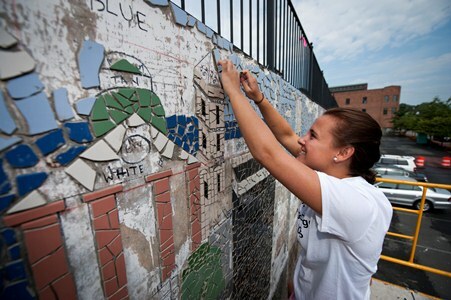 All 530 first-year students participated in a day of service to start the 2012-13 academic year. They painted, weeded, picked up trash, prepared meals, and did a variety of other work needed by local nonprofits and city departments as a way to introduce them to their new community. Students donned waders and clambered down the stream bank at Sandusky Park to collect tires, chairs, basketballs, and other trash from Blackwater Creek in support of Citizens for a Clean Lynchburg’s Nels Erickson, a 2012 LC graduate, who led them downstream toward College Lake. “We collected 50 bags of trash and 15 tires,” Erickson said. The effort received extensive local media coverage. Click on these links: WSET, WDBJ7. Students worked in two shifts at a variety of sites throughout the Hill City, including the Adult Care Center, the Free Clinic of Central Virginia, His Vision-Virginia Eye Clinic, Jubilee Center, Lynchburg Covenant Fellowship, Lynchburg Daily Bread, Stop Hunger Now, Camp Kum Ba Yah, Rebuilding Together, Amazement Square, Park View Mission, Miriam’s House, and Lynchburg Parks & Rec and Public Works.